I purchased my refrigerator back in September, and I have been loving it! We upgraded from a small top/bottom fridge, and it's making a world of difference in storing our food. I can actually SEE what's inside. The ice maker and water dispenser are a little slow/strange setup, but I've gotten used to it. Everything else has been working perfectly! This refrigerator started with cracks in it inside right away. Piece of junk. I thought that buying a side-by-side fridge would actually make it easier to organize and rotate my food--more shelves usually means more options in my experience. Well, what it actually meant is that there is now more back wall to develop a thick layer of frost and mess up the temperature. 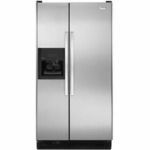 The fridge and freezer sections both have a lot of storage space, it is true, and the ice machine has so far been going strong, and I do like the color and design and the way the appliance fits in my kitchen. 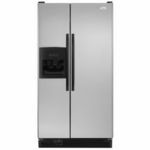 It's an Energy Star fridge, too, which is great for the envirnment and makes me feel like I am doing my part to keep the earth a little cleaner. However, the fact that I have to go into my freezer every month, defrost it, and scrape all the ice off the back makes this refridgerator a purchase I don't think I would make a second time. 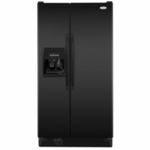 It is a pity, because in general I like GE products and I have never heard a bad review from my friends who also own GE appliances. Just not the best thing they have ever made, i suppose. This fridge has so much room and keeps my food as cold as I need it to. It also has a really cool design. Noise Level There really is no noise level with this fridge. You don't even know that it's on because it runs so quietly. I love how quiet it is. Interior Organization This fridge has great organization inside. You can fit your small foods and your big foods and drinks. There is room for everything that you need to refrigerate. Temperature Control temperature control is so easy to manage. You can learn how to control the temperature in no time at all. Ease of Cleaning It's very easy to clean this fridge both inside and out. It is made of an easy to clean material on the outside and the inside is just as easy to clean. All you need is a wet cloth or paper towel and you're done in a snap. Durability Very durable fridge. I have never had any damage from bumping into it or dropping something inside. Design This fridge has a great design. It looks great in my kitchen and is sure to look good in any style of kitchen. I really love it! 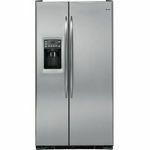 I have used GE for over 25 years and I have always been very satisfied with all of their appliances. High quality at reasonable prices. They are long-lasting and don't need repairs. Noise Level It is very quiet and runs efficiently. Interior Organization Lots of spaces and drawers with retractable shelving. The side doors have shelves that can be adjusted up or down to accommodate different size products that you and your family use. It can be customized to meet your food storage needs by moving the shelves. Temperature Control It has great options for different temperatures for different compartments used for different types of food. This keeps food fresher longer and saves you money. Ease of Cleaning It is so easy to wipe down inside and out. There is no freezer buildup. Durability It is very long lasting! I feel like it will last as long as I have my current kitchen. Design It looks great in my modern kitchen. My other appliances are GE so it matches well too. I purchased this refrigerator about a year ago as my old one went out. I got this one because it was the only one I could afford at the time as well as being a little space limited and couldn't get bigger one. First of all, I am not that crazy about how small the storage space is in this. It definitely does not hold that much food and I ended up having to purchase a separate stand alone freezer in which to store my meat bought at the grocery store. Second of all, the motor has gone out once and the ice maker has frozen up several times causing me to make repairs I could ill afford at the time. 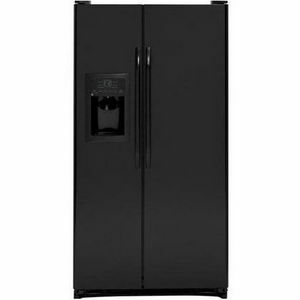 Typically, I am fond of the GE brand as I have never had problems with them before, but I seriously regret every purchasing this refrigerator as it has caused me nothing but problems. I can honestly say without a doubt that I would discourage anyone from getting this particular brand and I am looking forward with enthusiasm to getting one that I know will last a long time and give me no problems whatsoever. I have used this Refrigerator for the past 4 years. It has worked wonderfully for me. The ice maker quit last year and I have had to turn up the cooling a couple of degrees past the recommended level. The glass shelves still look great and while the bottom drawer sticks and seems to creak it hasn't broken. Where I live the water is full of minerals and since I cannot afford the filters the front has been stained white (from my kid who can't reach) but the water comes out fast and cold. My Brother in law has a brand new fancy Refrigerator but you have to wait forever for the water to fill your glass. This one fills the cup up fast. The only issue was one time the door didn't get shut all the way and the Refrigerator shut off. We had just gone grocery shopping and all the food was lost but the Refrigerator started cooling again once the door was fully shut. Noise Level Occasionally the freezer fan will get some condensation on it and it will rattle also the water line rattles sometimes when refilling the water tank. Interior Organization You set the shelve levels yourself Ease of Cleaning Spill stopping shelves have a lip to prevent the spill from overflowing onto other shelves which is nice but when cleaning that lip catches dirt and the only way to clean that lip is scrubbing. Design I have seen fancier ones with door for the kiddos which would be nice but really this one works well for the price point. A good value for a good refrigerator. 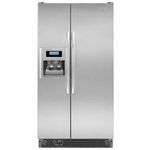 A good value but with any refrigerator with an ice maker and water dispenser, these always breakdown after a year or two. First my water filter cracked and then the ice maker stopped working. These annemities are the conviences we were willing to pay extra for but they are the most unreliable. This refrigerator is probably the best one that I have used in my lifetime. Have never had any issues with it breaking down, and it's very practical. It does not take up a lot of space but it gives you all the room you will need to store items. The temperature is always kept up well and it's easy to clean as well. The design really fits well in my kitchen, but is versatile enough to look good in just about any home. I really do like tho unit. The fridge spaw is very nice. It has 3 tempered glass shelves that you can move to the right height. One has a built in snack tray that is great to keep yogurts and other snack items! It also has two drawers at the bottom with separate humidity controls. We actually have this in stainless steel and it looks very nice in our kitchen. The only bad thing is that the freezer is not big enough. I really feel like I need a deep freeze because I do have to watch what I buy for freezer stuff so I don't run out of room.